Find your spiritual home. Connect with our welcoming parish. St. John’s is a welcoming, open spiritual home that offers an abundance of opportunities to connect with God and with a warm community. Our church offers a beautiful, sacred space that provides peace and tranquility to members and visitors alike. Located just where West Hartford and Hartford join geographically, our parish has a core mission of building bridges between and among the residents of our diverse communities. A thriving crossroad where faith meets fellowship. This is a place where meaningful, lasting connections have been created for more than 175 years. Steeped in Anglican tradition, our liturgy is hundreds of years old, yet experienced in fresh new ways. Our spiritual practice is firmly anchored in ritual and symbolism, yet progressive and accessible. A diversity of connections to God and each other. At St. John’s, there are so many ways to connect with our faith: through our renowned music programs, through traditional and modern forms of prayer, and through experiencing our sacred architectural space itself. Every time you venture through our big red doors, you’ll find many diverse ways to connect with an openhearted spiritual community. You might want to join in a Sunday morning service, introduce your children to our many youth programs and education resources, or participate in weekday Bible or book study classes. On any given weekend there are popular concerts, cultural events and educational programs to choose from. You can participate locally in community literacy programs and refugee sponsorship activities, or join broader global outreach activities such as our partnership with an Episcopal school in Haiti. An invitation to nurture your spirit and enrich your soul. 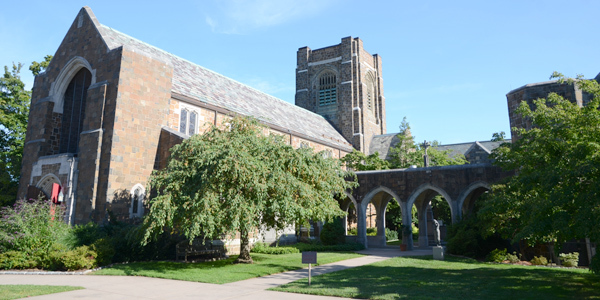 We hope you’ll give us the opportunity to welcome you to our spiritual home, St. John’s Episcopal Church. Please stop in or fill out our newcomer information form, and explore how our unique ministry can become a significant, rewarding part of your own spiritual journey.